iSleep Pillow Turns Your Laptop Into Something Useful | OhGizmo! With some exceptions, laptops make horrible pillows. I mean, what were they thinking, designing them out of plastic and metal with no soft squishy bits for you to rest your head on? But have no fear: the iSleep pillow computer, um, peripheral (I guess) can give some practical purpose to that pile of circuit boards you’re lugging around. The iSleep pillow attaches to your computer’s exhaust vent, and uses the warm air to both inflate and heat itself. A valve lets you adjust firmness. There’s some kind of integrated speaker that plays a selection of your music for as long as you’d like to nap for, and then plays an increasingly annoying tone when it’s time to wake up. I think it would be more effective for the pillow to rapidly deflate itself and slam your head down onto your laptop to wake you up, but I suppose something could get cracked that way. 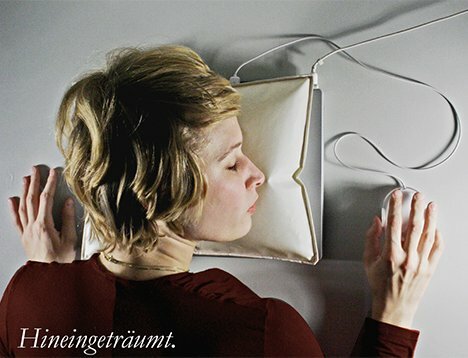 iSleep is currently just a concept, and was designed by Ivonne Dippmann. oh and btw – i have never seen a laptopcooler fan having more pressure than that of dyings bug breathe. i somehow cant believe you can use it to pump up anything.